Projects completed by November 30th are eligible for the monthly prize drawing – first prize is a set of addi Clicks! See skacelknitting.com for all the info. 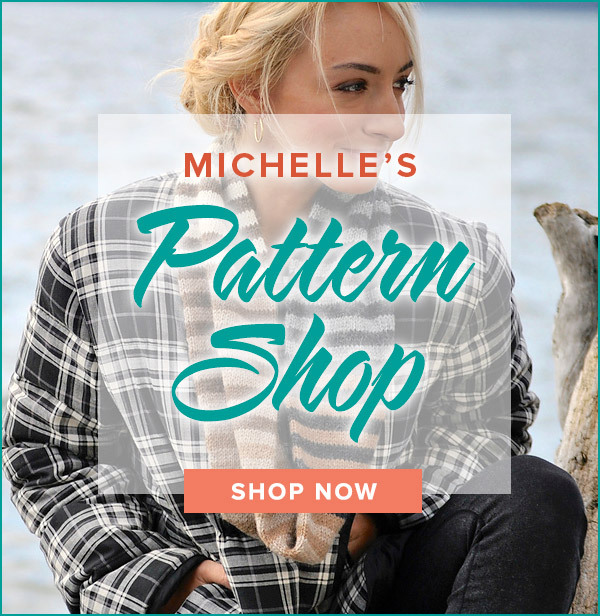 VERY IMPORTANT: Match Play is a FREE pattern through November 30th. After this date, it will only be available for purchase on Ravelry. Be sure to download each portion of the pattern prior to this date. Saving it to your Ravelry page will NOT save the pattern. The helpful tips and videos for each section will remain on my website indefinitely. Match Play is worked in two pieces knit from the bottom up. Part One consists of one side of the poncho to the neck shaping. Let’s get started! We begin by casting on 208 stitches. 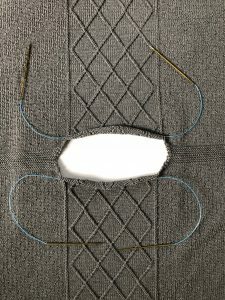 When casting on a large number of stitches, I have two favorite methods that each eliminate the dreaded tail calculation. The Crochet Cast On requires no tail and leaves a clean, attractive edge. My video will guide you through the simple steps. If you are not comfortable wielding a crochet hook, you can choose the Long Tail Cast On using two balls of yarn. This little trick saves yarn and gives you the perfect tail length every time. Watch my Long Tail Cast On (No Yarn Tail Estimate) video to add this to your knitting bag of tricks. Once the stitches are cast on, the lower hem is worked in garter stitch. Row 1 is a Wrong Side row and worked in all knit stitches. After working the first row, turn your work and hang a marker on the Right Side of the fabric to avoid confusing the sides in this reversible fabric. Starting with Row 2, every row will begin with a slipped stitch with working yarn held to the front. 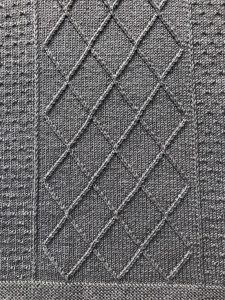 A slipped stitch edge should never begin on the first row because it pulls up a cast on stitch which will yield a distorted edge. The photo below shows a garter stitch sample with the left edge worked in all knit and the right edge receiving the slipped stitch treatment. The slipped edge is smoother and tidier making it a great choice for exposed edges. You can see why I chose to use it in my Building With Lace book along the garter edged shawl. My version of a slipped stitch edge is to slip the stitch as if to purl with the yarn in front. 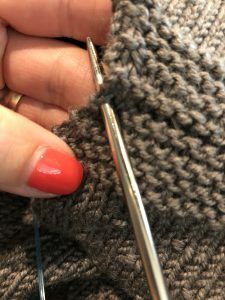 Once the stitch is on the right needle, return the working yarn between the needles to the back of the work and ready to work a knit stitch. 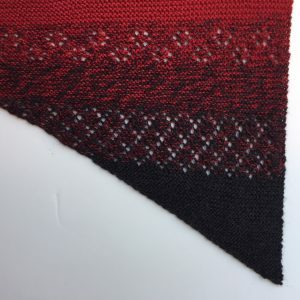 This action slightly twists the stitch and makes an elegant edge. See Slipped Stitch Edge video. Continue working through Row 18, slipping the first stitch of every row. Note that Row 18 is a Right Side row. With Wrong Side facing, begin the three Set Up rows. Row 1 places the markers in the correct positions to separate the different stitch patterns. In Row 2, with Right Side facing, the stage is set for the upcoming designs. Note that the stitch after the 2nd marker and before the 3rd marker are slipped as if to purl with yarn in back adhering to the customary slipped stitch rule. 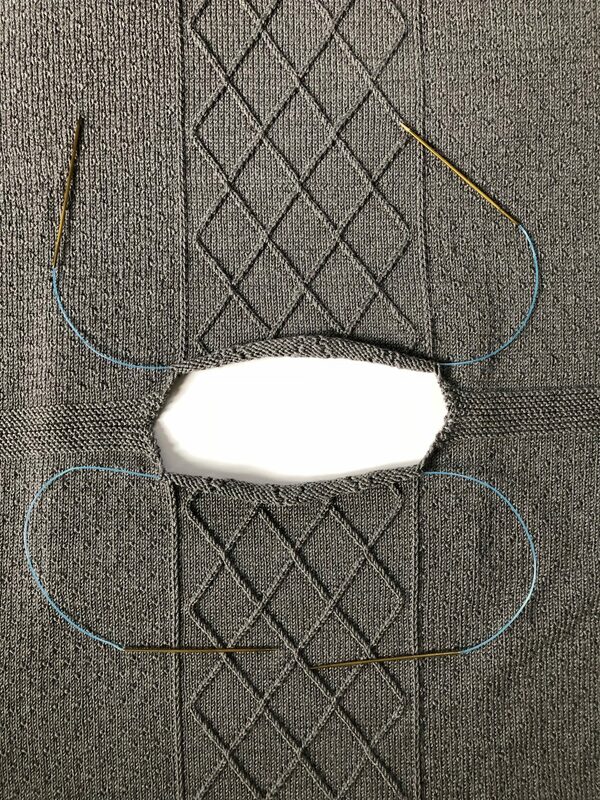 Row 3 is a Wrong Side row maintaining the established garter edges and purling across the body designs. From this point forward, all markers are slipped while working across the row and will not be mentioned again. 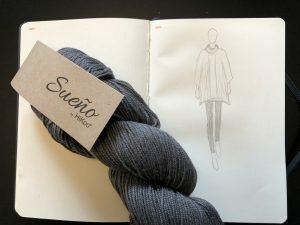 The carefully placed markers will guide you in working the different stitch patterns used on this side of the poncho. 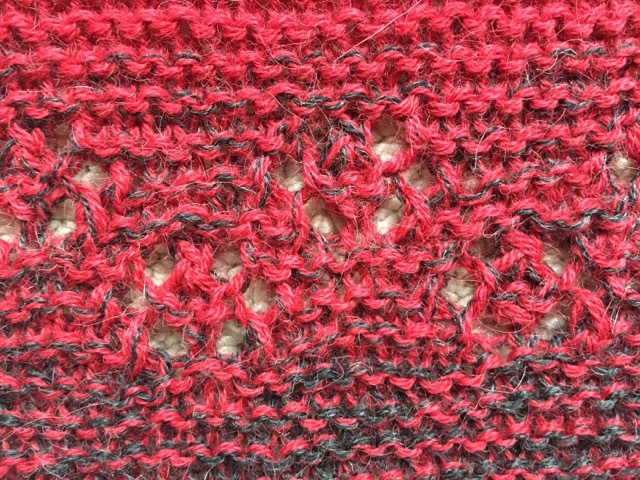 The first five stitches (before the 1st marker) and the last five stitches (after the 4th marker) will remain in the established garter stitch edge. Continue to work them as in the Lower Edge. 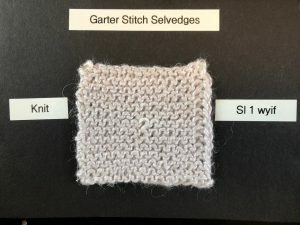 These garter edge stitches are NOT included in the written instructions or in the charts. I am trusting that the markers will serve as a reminder to maintain the edge. 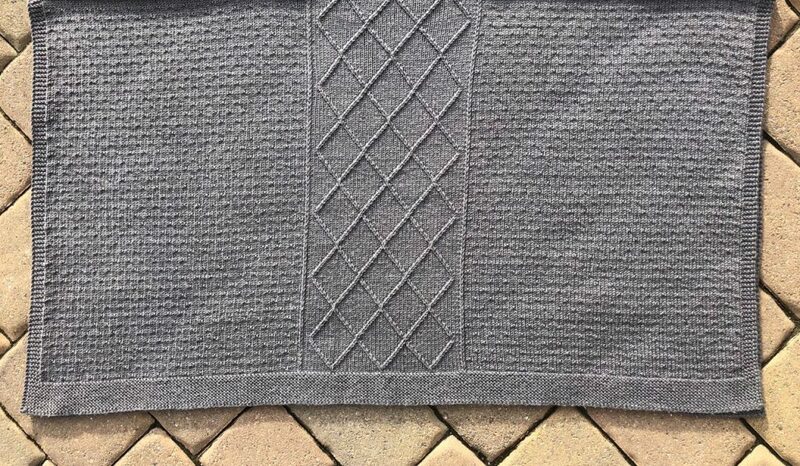 The center motif, worked over the 48 stitches between the 2nd and 3rd markers, is the lovely Diamond Pattern featuring left and right twists. I have always been disappointed with my left twists in these types of patterns where left and right twists are side by side. The right twist was always smooth (see Right Twist video), but the left twist looked a little wobbly. I have tried several variations but couldn’t find a mirror image to the right twist – until now! For a beautifully smooth left twist, slip each stitch one at a time as if to knit onto the right needle. (Same as if working an ssk.) Return these stitches to the left needle. Next, knit the second stitch through the back loop and then knit both stitches together through the back loop. Taking the time to work these extra steps yields superior results. Watch my Left Twist (Mirror to Right Twist) video and see if you agree! The Diamond Pattern has both written and charted instructions. The chart is color coded to easily identify the appropriate twist required when moving across a row. Work the 28 rows of the Diamond pattern six times to complete the motif. Flanking both sides of the Diamond Pattern is the textured Dot Pattern. 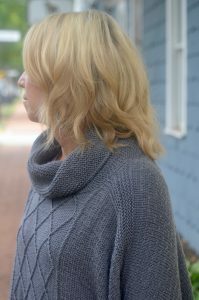 This simple knit and purl design transforms stockinette into a interestingly nubby fabric. The Dot Pattern is worked over the 75 stitches directly before and after the center motif while simultaneously working the Diamond Pattern. Both written and charted instructions are provided for the Dot Pattern. The 8 rows of the Dot Pattern are worked 21 times. The Dot Pattern has a repeat of 8 rows while the Diamond Pattern has a repeat of 28 rows. To keep track of the multiple patterns, I find it essential to use two counters – one for the Diamond and one for the Dot. Because I want to spoil you, I have created a chart that does the work of the two counters for you. (Applause, please!) The left hand column indicates the Right Side row number of the Diamond Pattern. The following columns indicate the corresponding Dot Row number for each of the six repeats. All Wrong Side rows are purled so they are not included in the chart. You can download the chart here. At the conclusion of Part One, the piece measures approximately 22″. I joined my 4th skein on Row 24 of the 6th repeat of the Diamond Pattern. There is a generous amount of yarn for the pattern so everyone should be well within the yardage range. Match Play is designed to be a one size fits most garment. 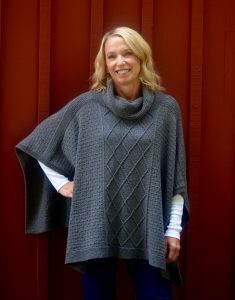 Women ranging from size 0 to 2X tried on the poncho and were thrilled with the fit. 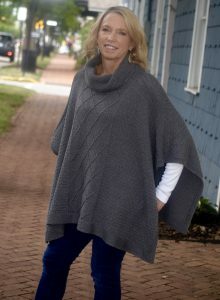 If you would like to make the poncho shorter or longer, work the Diamond Pattern fewer or more rows to the desired length ending after ANY Wrong Side row. (It is not necessary to complete a diamond.) Be sure to note the last row number worked for future reference. 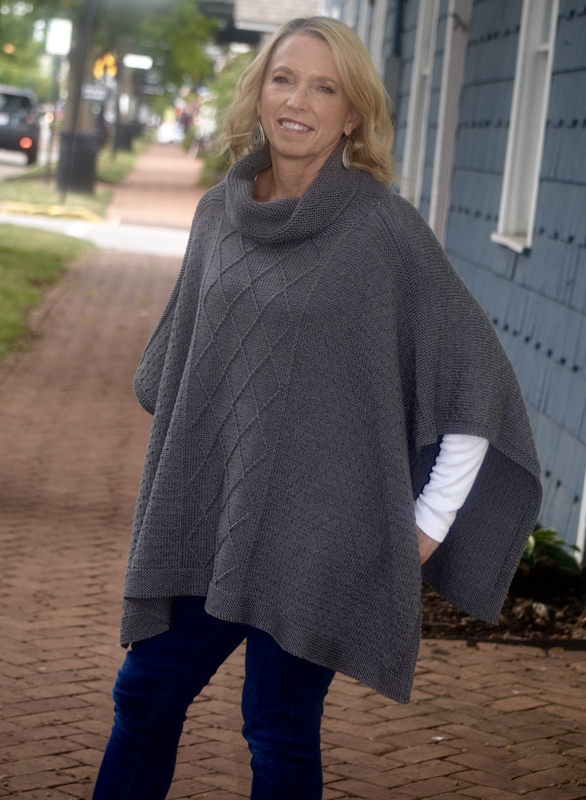 If you would like to change the width of the poncho, increase or decrease the number of Dot Pattern stitches by 4 stitches on BOTH sides of the center motif. 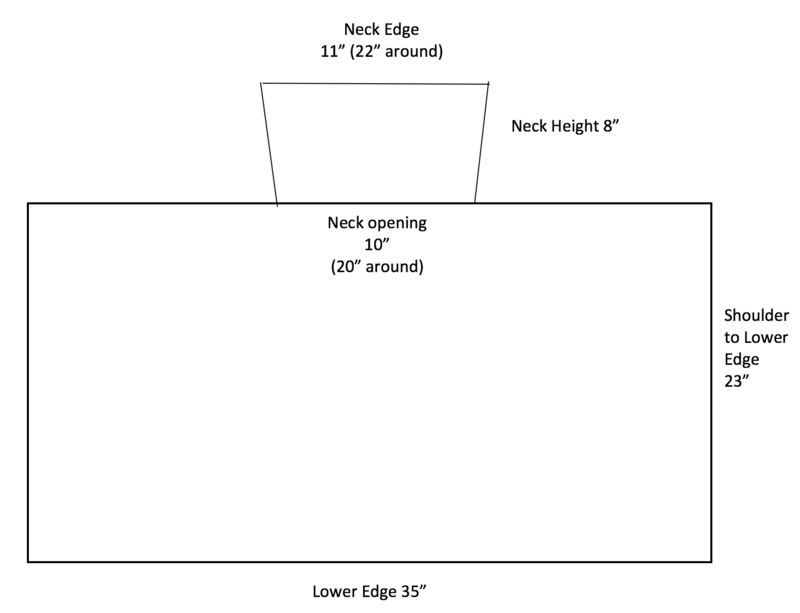 I have not worked any variation of the given size so I am unable to comment on the yardage needed to alter the width. Next week’s clue is very short which essentially gives you two weeks to complete this side. I hope you have fun with both the yarn and the stitches! 35” wide across front (70” circumference), 23” long from shoulder to hem. I hope you enjoyed last week’s knitting. This week brings us to the end of worrying over stopping points at the color changes, stitch counts and yardage. From now on, the yarn is the boss! We begin Section 6 with 126 stitches on the needle. This is the required amount needed for our upcoming lace section. It doesn’t matter if you have some of BBBB remaining or if you started knitting with BBBC in the last section. 126 stitches is all you need and you can toss the other worries aside. 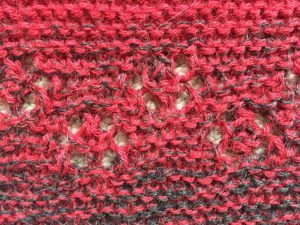 Section 6 is a simple lace repeat that is pivotal to the design. In this section, three color ways are worked through to showcase the lace and the interesting gradient nature of the changes. The beauty of this lace pattern is that it can be stopped after ANY wrong side row. Everyone will stop Section 6 once CCCC emerges. Begin by working Rows 125 – 136. 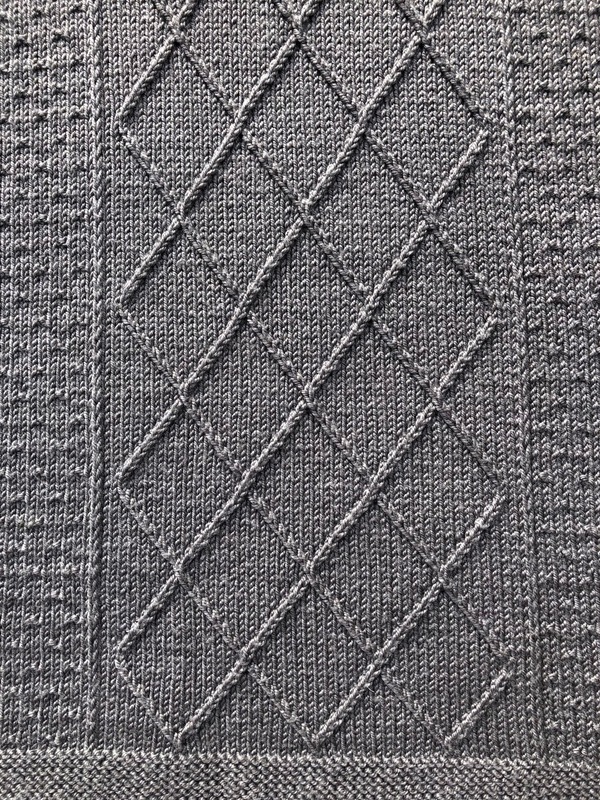 While the repeat (stitches after the *) is the same in every Right Side row, be careful to knit the correct number of stitches before and after the repeat in each row to establish the pattern. 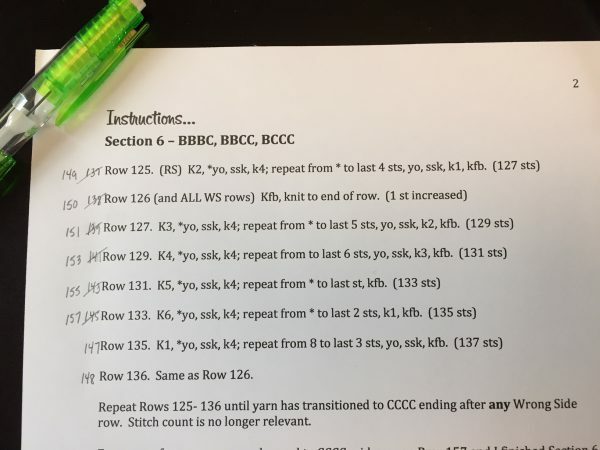 After Row 136, repeat each of the rows until the appearance of CCCC in your work ending after working a Wrong Side row. If your yarn changed to CCCC on a Right Side row, no worries; just knit one more Wrong Side row. It is completely fine if your yarn in this last row is all CCCC. I knit several sample shawls and my yarn changed at different points somewhere in Rows 156-158. It is completely fine if yours changes in a different row! Just remember to finish after a Wrong Side row and you are good to go. In the instructions I list my stitch count and rows for the sample seen pictured here. I still like to keep track of my row numbers even though it doesn’t really matter where the section ends. My brain just feels more comfortable with marking the rows as seen in the photo below. You can also use hash marks or a sticky note to keep track as well. If you are unable to knit with Concentric, follow the row directions for Section 6 ending after Row 158. Due to the absence of precise color changes, non – Concentric knitters will need to keep track of the row numbers to complete each section. This section is another garter stitch buffer and is knit in CCCC. Just like the previous section, it doesn’t matter how many rows or stitches you have at its conclusion. All that is necessary is to stop once the yarn changes to CCCD, ending after a Wrong Side row. At the completion of the final Wrong Side row, there should be an even number of stitches on the needle – that is all you need. Next week’s Section 8 will bring us a fun pattern to work over these even numbered stitches. As noted below, my yarn changed to CCCD mid-row on Row 167, and I finished Section 7 after Row 168. (170 sts) It is perfectly fine if you ended on a different row and stitch count! Non-Concentric knitters will work through Row 168 (170 sts). I loved this section and I hope you have fun with it, too! 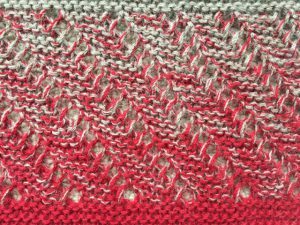 This week’s knitting brings another garter stitch lace pattern nestled between two bands of garter stitch. 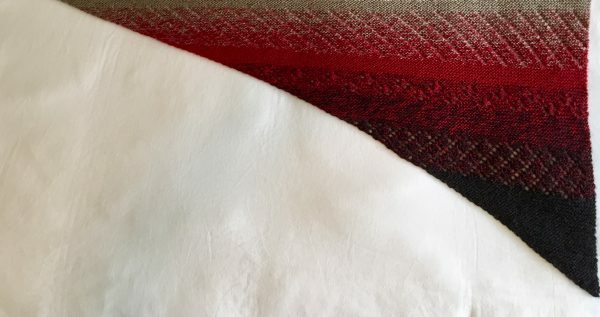 I think you will love the charm it adds to our reversible shawl. I recommend inserting a lifeline into your knitting before continuing on with the following sections. I don’t want you to lose last week’s hard work. We begin at Section 3 which is knit with Color AABB in all garter stitch. Depending on how much remained in your run of Color AAAB, your yarn should change to AABB in short order. For your reference, all of my samples changed to AABB somewhere in Row 77. It is OK if your color change is a bit different – the gradient nature of the yarn is very forgiving! At the end of Section 3 you will likely be knitting with ABBB or pretty close to it. My samples changed to ABBB somewhere between Row 94 and 95. You must continue through Row 96 to reach the required 98 stitches for the upcoming lace in Section 4. Section 4 is the shortest one so far and you will find yourself left with a good length of ABBB remaining after Row 108. I had approximately 40 – 45″ of ABBB remaining after Row 108 in my samples. Have no fear if yours is different – we are almost to the end of row concerns in the shawl! 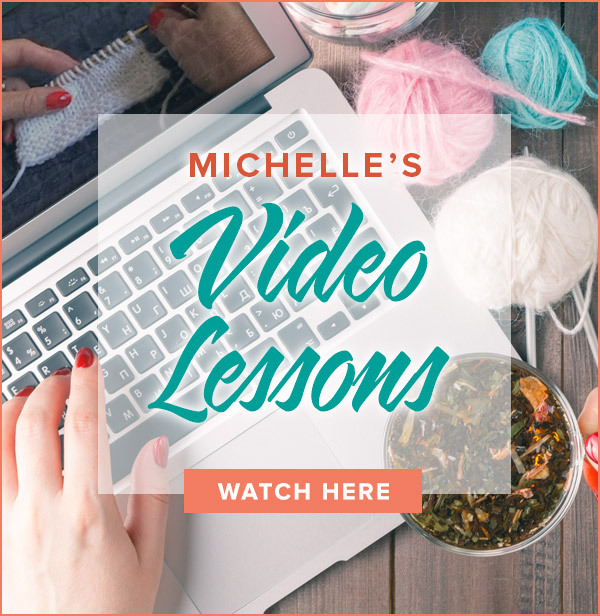 For the newbie lace knitters in the group, rest assured that the upcoming patterns are very simple and relaxing. Be proud of your progress! 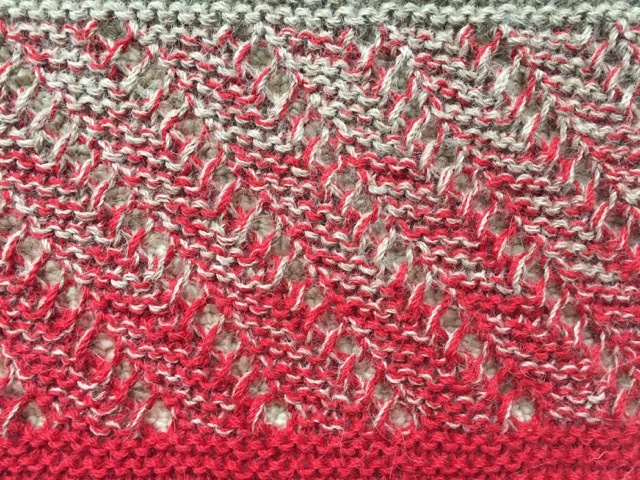 Another stretch of relaxing garter stitch awaits you in Section 5. The yarn changed to BBBB in my samples ranging from Row 109 to 111. My yarn changed to BBBC in Rows 123 or 124. Everyone must knit through Row 124 to achieve the required 126 stitches needed for next week’s Section 6. After Section 5, you will no longer need to worry about the yarn changing at or near a prescribed row. Next week’s clue uses a new formula that is unique to each knitter. It’s so much fun!